Traditionally a tourist and lifestyle destination attracting over 11 million visitors each year, this picturesque beachside city has taken many of its natural assets and evolved into one of the most modern and dynamic cities in Australia. With more than 260 kilometres of protected waterways (9 times more than Venice) and close to 300 days of sunshine each year, it is no surprise that the Gold Coast has one of Australia’s largest boating communities and consequently plays home to the highest concentration of skilled marine trades in the Southern Hemisphere. Approximately 10 nautical miles from the seaway is the 250-hectare dedicated Gold Coast Marine Precinct. A centre of excellence for marine servicing and boat building which plays home to a host of internationally recognised marine brands and manufacturers. The city has 57 kilometres of internationally acclaimed surf beaches, over 100,000 hectares of world heritage-listed rainforests, 40 premier golf courses, major theme parks, a casino and an events calendar bursting with world-class entertainment including the Magic Millions horse races, major music festivals and surf titles. The Gold Coast’s food and wine scene does not disappoint with an interesting mix of stylish and modern restaurants and bars with stunning views. Less than an hour from the Gold Coast is the well- known coastal town of Byron Bay with a relaxed, hip vibe, spectacular coastal trails and amazing marine life including dolphins, turtles and whales. 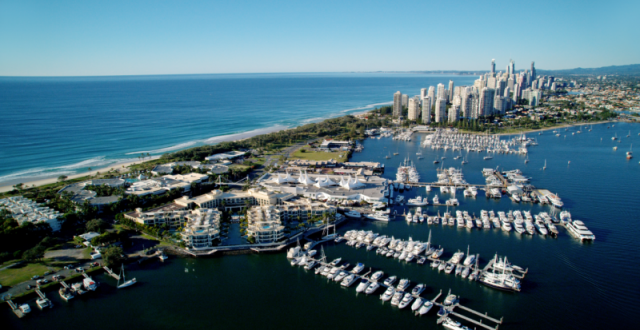 As a dedicated Port of Clearance and located midway between Cairns and Sydney, the Gold Coast is an ideal destination for superyachts to stopover or use as a base to explore the South Pacific and east coast of Australia. Temperatures ranging from 21 degrees in winter to 29 degrees in summer. 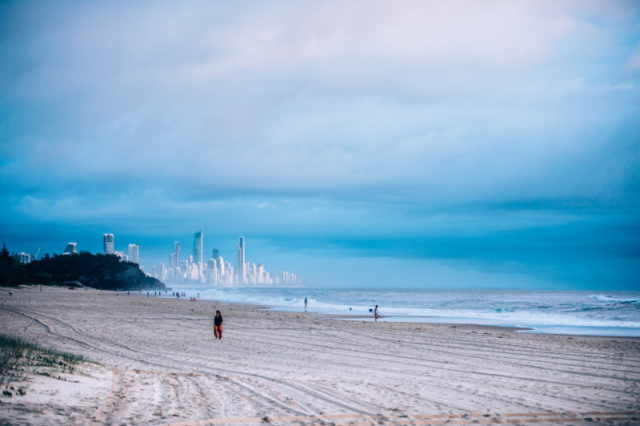 Queensland’s Gold Coast has a population of more than 590,000 and is one of Australia’s fastest growing cities. It is glamorous and relaxing to some, adventurous and active to others. For further information about the Gold Coast click here.